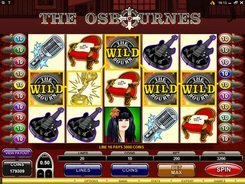 The Osbournes is a music-themed slot with a standard 5x3 reel configuration and lots of features. On the reels you will come across Osbourne family members, microphones, guitars, music trophies and other theme-related symbols. 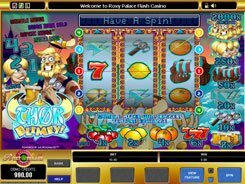 Played over 20 paylines, the slot allows to make the following adjustments to a spin bet: a coin value ($0.01 to $1), the number of coins (1–10), and the number of paylines. 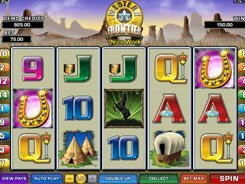 The maximum wager is $200, but low-limit players can play the slot with the minimum wager of one penny per line. 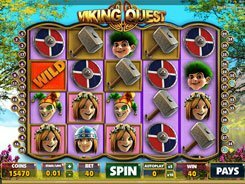 The slot has a Free Spin Trail Bonus with 10 free spins at a x2 multiplier which can bring you up to 300,000 coins. 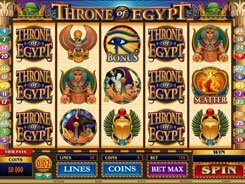 There is also a Grab a Gift Bonus activated randomly in a normal game where you can win one of four gift boxes that contain a range of multipliers with a maximum of a x30 multiplier applied to your total bet. 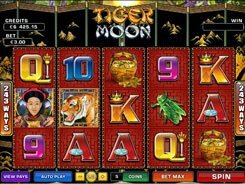 The top jackpot prize of 15,000 coins (or a hefty $150,000) is granted for hitting five wild symbols. To sum up, The Osbournes is a feature-rich game with pretty generous bonus rounds and impressive jackpot wins.